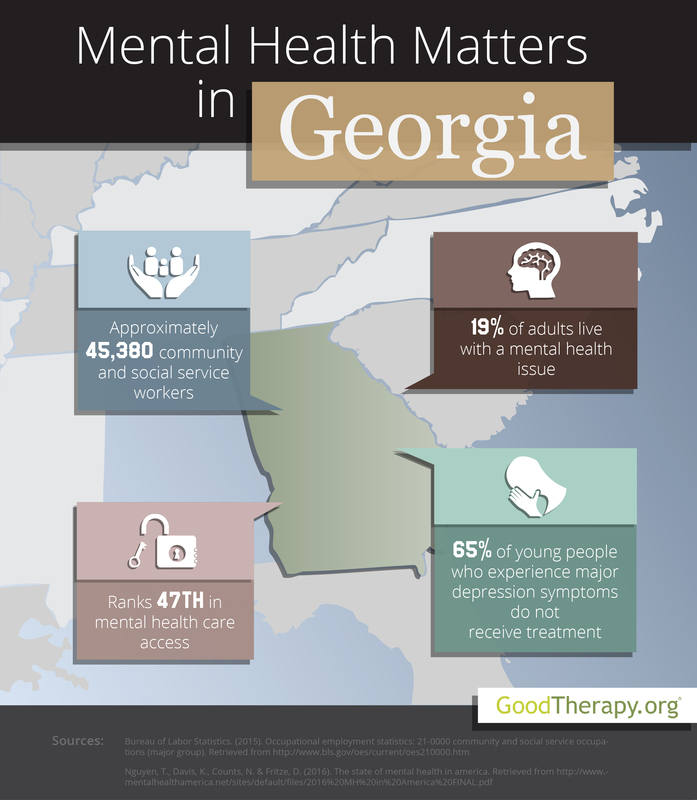 Find a therapist in Georgia with GoodTherapy.org. Statistical data gathered and presented by the Bureau of Labor Statistics (BLS) shows that in 2015, roughly 45,380 people were employed as child psychologists, clinical social workers, psychiatrists, residential treatment center counselors, counselors at drug and alcohol rehab centers, parole officers, religious workers, health educators, and marriage and family therapists in Georgia. People who worked in these community or social service occupations earned a an average annual salary of $44,150 and served approximately 10.2 million Georgia residents in 2015. After being ranked alongside all states and the District of Columbia in Mental Health America’s (MHA) 2016 survey, the state of Georgia was listed 18th overall in mental health conditions and practices. Georgia was also evaluated in several specific mental health categories. The state was 1st in prevalence ranking, indicating a low rate of mental health concerns experienced among residents. However, Georgia was 47th in access to mental health care ranking, which suggests residents with adverse mental health conditions will likely face barriers when trying to obtain the mental health services they need. Researchers have identified a number of social and economic factors that may have impacted the state’s prevalence and access to care rankings. According to the 2016 MHA report, Georgia’s very low prevalence of mental health issues correlates with low rates of child maltreatment within the state; on the other hand, Georgia’s access to care ranking correlates with low rates of graduation from high school, higher rates than normal of toxic chemical release, high rates of unemployment, and high rates of poverty in the state. At about 7.5%, Georgia has the second lowest percentage of adults with dependence on drugs and alcohol in the country. A little more than 3% of adults in the state have serious thoughts of suicide—the sixth-lowest percentage nationwide. Georgia also received top rankings in several mental health measures for young people—placing 4th for adolescents with at least one past year episode of major depression; 10th for adolescents with alcohol and drug abuse issues; and 2nd for young people with severe episodes of major depression. These ranking coincide with Georgia’s overall low prevalence of mental health issues. The 2016 MHA report ranks the state as 46th for adults with mental health issues who did not receive treatment; 47th for adults with mental health issues who are uninsured; 50th for adults with disabilities who could not see a doctor due to cost; 47th for young people with severe symptoms of major depression who received some consistent treatment; 44th for children with private insurance that did not cover mental health issues; and 48th in mental health workforce availability. These are all low rankings that indicate there is much work to be done in mental health care in Georgia.